Abbott Cell-Dyn Sapphire In-Vitro Diagnostic Hematology Analyzer Accessories PC . New Life Scientific, Inc.
-Tested with distilled water and confirmed pumps were functional. Accessories: 3) #08H13-01 CDSPHR DIL SRNG 10ml, 3) #02H63-02 ASPRTN NDL, 1) #08H48-01 CDSPHR RETIC SRNG, 2) #08H46-01 CDSPHR IMPD SRNG, 2) #08H45-01 CDSPHR RGT SRNG X, 1) Flush Tubing and assortment of different interface cables. 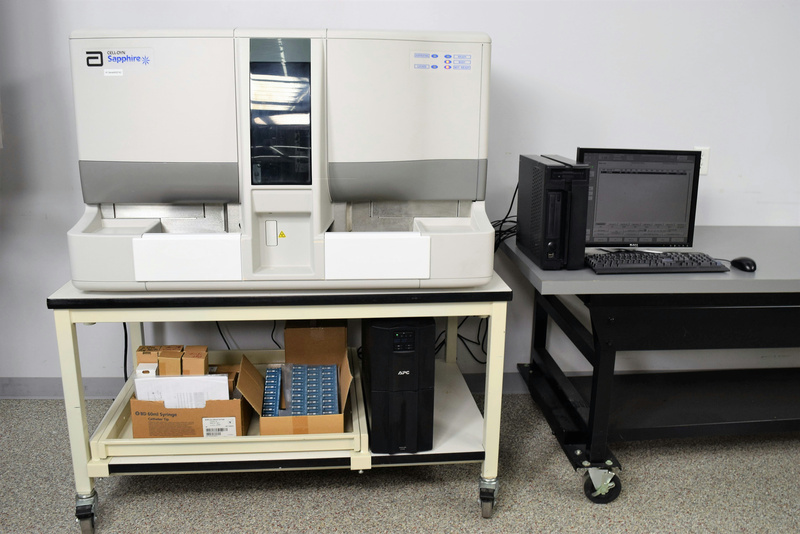 This Abbott Sapphire hematology analyzer was manufactured in April 2013. New Life Scientific technicians noted that this diagnostic instrument was clean and well maintained in the former lab setting. NLS Technicians ran a successful fluidics test of the instrument using water. The pumps were verified to be functioning, and the instrument recognized the fluid was not the intended reagent, indicating the sensors are functioning. For more sales and shipping information, please contact New Life Scientific. New Life Scientific recommends that the customer have this product re-certified by Abbott prior to application. The Abbott Cell-Dyn Sapphire is a fully automated hematology analyzer that can perform in vitro diagnostic readings. The Sapphire has a capacity of up to 105 samples per hour with single range analysis, using a volume of 120 microliters. This instrument uses multi-angle polarized scatter separation and 3-color fluorescence to detect and quantify WBC, RBC, HGB, nucleated and immature RBC, and monoclonal antibodies.